Before last night's screening Jia Zhangke's THE MOUNTAINS MAY DEPART was hailed by Film Society of Lincoln Center Programmer Dennis Lim as being possibly the greatest work by one of the most important filmmakers in the world today. No offence but someone needs to check Mr Lim's meds since I think he is wildly over stating the case on both accounts. 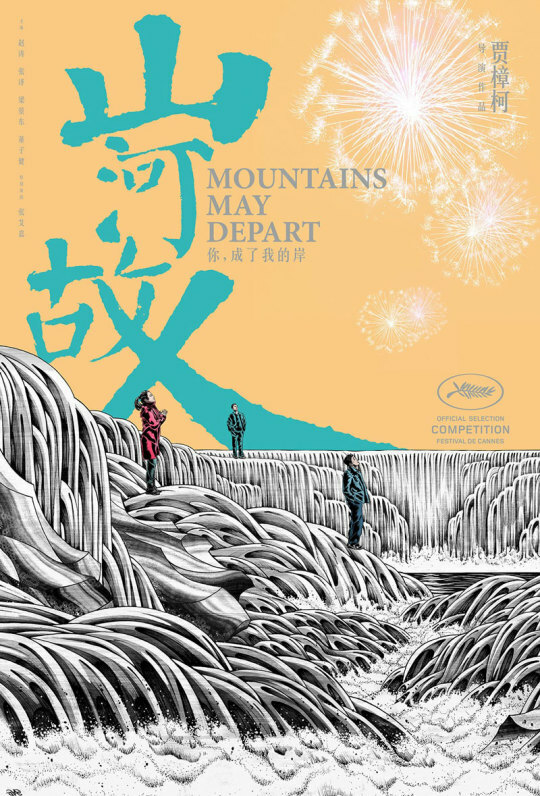 MOUNTAINS is most assuredly a very good film, but I would argue it's not great, and while I think Zhangke is a really good filmmaker I think it's too soon to know if he's on the list of most important. You will forgive me the hyperbole but it was an evening full of it as everyone over sold everything, especially actress Zhao Tao who kept saying that the role required her to play an old lady- of 50- something that's only ten years ahead of her. Everyone kept correcting her. MOUNTAINS is nominally the story of a woman named Tao. Beginning in 1999 she is wooed by two men. One a poor man who runs the helmet concession at the local mine. The other a rich friend who owns a gas station, makes lots of money and is looking to buy the mine. When the two men get into a tiff over Tao she is forced to choose- setting in motion the rest of their lives. The film next jumps ahead to 2014. Tao is now divorced. Her son, Dollar, lives with her rich ex and his new wife. When her father dies her son is sent home for the funeral and we watch the ice between them. The film next jumps ahead to 2025 and is focused on the now college aged Dollar as he tries to find a place to belong. MOUNTAINS is for 2/3rds of it's story a compelling story of the choices we all must make in life and how they come back to haunt us and our children. The film is also an interesting look at the changes with in Chinese society. While the time frame jump from 1999 to 2014 is confusing because the birth of Dollar would seem to take place a short time after the wedding-not some 8 years later so his young appearance at the funeral is confusing (I could hear several people around me comment on the seeming age problem and I was confused to), The real with the film is in the 2025 portion of the film. The problems with this last portion are all related to not having enough information about the characters to completely understand who they are. For example how did Dollar's dad go off the deep end? Why won't he speak English? What happened to his new wife? there are no clues and the result is it's confusing. The biggest problem is we know nothing about Dollar as an adult or even before. Largely quiet in the 2014 portion we know nothing about him other then he loves his stepmom but doesn't know his real one. He does come to connect with Tao when she gives him the keys to her house - "his home" but then the epsiode is over. That makes the his refusal to admit he has a mother all the more confusing. As we find out he does love her underneath it all but he refuses to remember her. Why? Not sure. Its also clear that his attraction to his teacher is purely Oedipal a fact that scares him when its pointed out by a travel agent. On a larger scale we really don't know why he's so messed up. Yes we know his dad is nuts and his mom is absent but there is more to it than that. There are lots of other little bits floating around the character that are supposed to get together to form a statement about society and how we don't connect but they all remain just hanging out there. I can see what Zhangke is doing and why, but all of it feels hollow as if he sacrificed the story in the final third for the intellectual point. Why couldn't he have moved the characters around more naturally instead of forcing square pegs in round holes? I don't know. In fairness I think this film may play differently if you are a Chinese native. There were a couple of times when the large number of Chinese speaking people around me laughed at lines that were not funny in the English subtitles. There was also a discussion after the film between several people behind me where a Chinese woman was explaining to her husband and friends certain nuances that you wouldn't get unless you came from China. I don't hate the film, I actually like it a great deal. I just have real problems with the final third which keep it from being truly great. To be honest I love chunks of the film. I love the use of image size, I love the use of music in the film especially the Pet Shop Boys Go West which results in an opening sequence that had me deeply moved and an ending that almost had me tearing up (I should have teared up damn it- if that last bit had been better I would have had a proper catharsis). I love characters and what the film is trying to do. I just wish it had reached the star instead of falling short. The film is do for a release in 2016 and should be on your list of films to see. The film gets one more screening tonight at the New York Film Festival. For more information and tickets go here. After the film Jia Zhangke and Zhao Tao took part in a Q&A. It was much too brief and to my mind didn't add a great deal owing to Tao's long discussion of her make up and performance. Zhangke did talk about where the film came from and how after the troubles with A TOUCH OF SIN he almost gave up filmmaking. He also explained how bits of the film came about from his life such as his mother giving him a set of keys to his home. After seeing incredible JIA ZHANGKE A GUY FROM FENYANG I had hoped there would have been more time to have him really talk about his film.